The Limited Edition Mosley Tribes X Clot Collaboration is now in stock. East meets West. 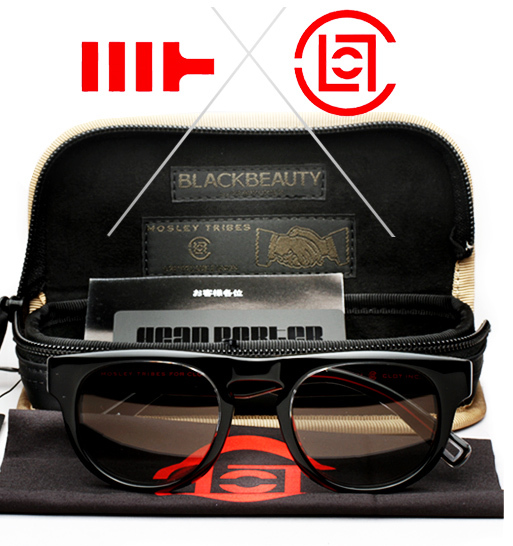 Mosley Tribes joins forces with Hong Kong streetwear label CLOT for a limited edition version of their Burke sunglasses. A worthy silhouette for the collaboration, the Burke has a cool and refined shape; they’re rounded and slightly contoured with a classic key-hole bridge. This special edition version is outfitted in a black and crystal acetate showcasing the exposed metal eye wire detailing. It also pairs grey glass photochromic lenses with a silver flash mirror coating. Photochromic lenses react to the UV/sunlight and get darker, thus providing for the most comfortable vision possible under various light conditions. The flash silver mirror gives off a silver iridescence when caught by the light. It comes complete with limited edition Head Porter of Japan sunglass case, as well as a custom cleaning cloth commemorating the collaboration. Limited to just 500 pairs released world-wide.